And do you agree with me, that the first condition of an artist should be to bear respect towards what is great, and to bow to it and acknowledge it, and not attempt to extinguish great flames for the sake of making his own rushlight burn more brightly? Jakob Ludwig Felix Mendelssohn-Bartholdy (February 3, 1809 – November 4, 1847), a child-prodigy, thence a famous German composer. 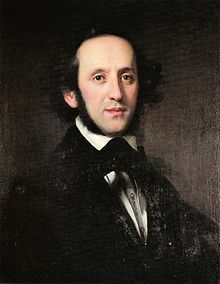 In his final years, Mendelssohn founded the University of Music and Theatre Leipzig. I dislike many-sidedness, which, moreover, I rather think I do not much believe in. Anything that aspires to be distinguished, or beautiful, or really great, must be one-sided.